If you walk down the street in San Francisco, keep an eye out for lop-eared, droopy-eyed figures with or without shirts sporting taut skin on a paunch gained during a few years’ hard living. Look for tags reading Twist, Amaze, R. Fong and L. Fong in variations on a certain blocky sans-serif font that casts a shadow. 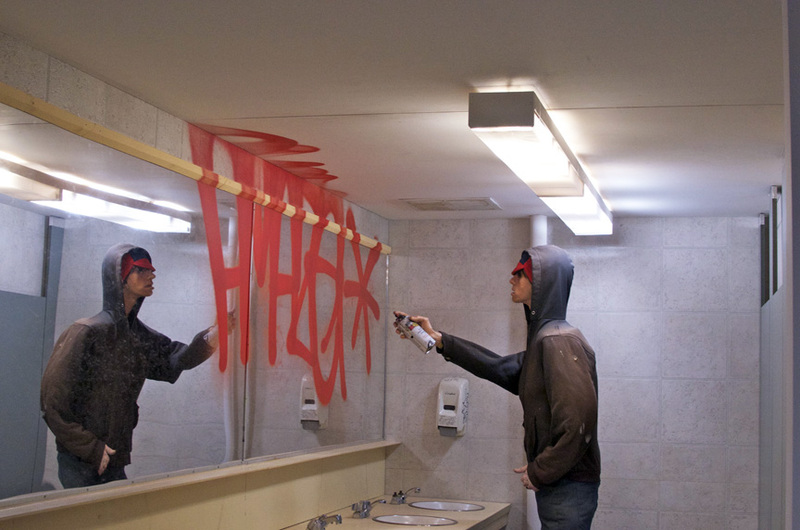 This is the work of street artist Barry McGee and his crew. Head to the Institute of Contemporary Art, Boston, and you will see the artist’s first mid-career retrospective. One of the first installations in “Barry McGee” features the artist’s coat displayed on a hanger, decked out with extra pockets for battered cans of spray paint and screwdrivers. The garment is joined by shelves of rusty cans, one even fixed to the end of a long handle for greater reach. What could be an underhanded reference to Joseph Beuys’s linen suit establishes McGee’s ability to straddle the antithetical worlds of street and institutionalized art. This chronological survey from the early 1990s to the present day shows his development from a young man scrabbling for a visual language to a mature artist. 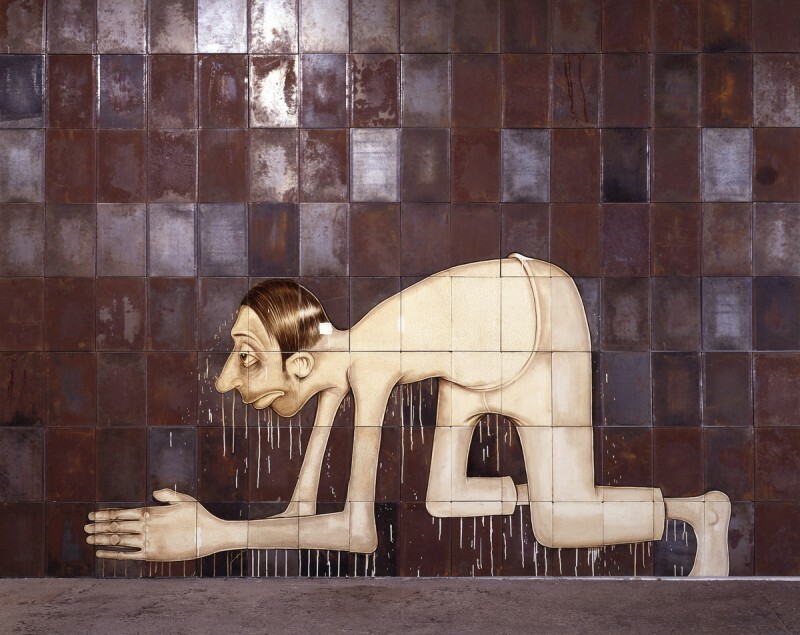 Barry McGee, Untitled (Crawling Man), 1999/2012. Image courtesy of Tom Powel Imaging. Shoplifters are not welcome chides “the management” in one artwork, setting the scene in the prohibited realm of the unsanctioned and illegal. What ties together the animatronic sculptures, dumpster topped with trash from the street and Op Art geometries in this exhibition are McGee’s politics and sense of social responsibility. His figures wear slicked back comb-overs and tank tops, wielding spray cans tucked in the waist of their pants. They slouch, crawl naked and stand with groups of look-alike friends. In this way, the artist combines self-portraits and fictional everyman personas with images of the outsize homeless population that did and does inhabit San Francisco. Visitors to the city by the bay who remark they have never seen so many people living in the streets, and in such an in-your-face way to boot, are noting one of the city’s great social failings. Barry McGee, Untitled, 1998. Image courtesy of Glenn Halvorson. McGee sets himself up outside of mainstream society by using such phrases as, “Not nearly as famous of Amos,” and, “What’s the in-flight movie?” But rather than isolate themselves, he and his collaborators deliver critiques of consumerism, class stratification and the financial crisis (sound familiar?) that are subversive in method and placement. While attending the San Francisco Art Institute in the late 1980s and early 1990s, McGee also worked at a print shop. After the letterpress gave way to digital technology, he began etching, drawing and painting in the disused letterpress trays. Capturing the decaying texture of the scrapyards and train depots where he often made art, one wall-size installation of these metal trays brings the outside world into the museum. In a similar way, whirring animatronic sculptures break the silence in the galleries with some of the chaos and racket of the street. These sculptures of taggers and street artists moving spray cans up and down recur throughout the exhibition, apparently deliberate caricatures of McGee’s talent, courage and craft. McGee is interested in the effects of accumulation and repetition. 31 flattened glass bottles decorated with portraits of local homeless comprise one work, old television sets playing a kaleidoscope of videos makes up a separate piece reaching to the ceiling. This is not meek work. If by now you’re questioning the place or role of a street artist in a contemporary kunsthalle, the artist is right there with you. Not one for subtle gestures, he bids us adieu in a room of his own curation. Familiar institutional pedestals and plexiglass cases mix with old tires, piled surfboards and broken skateboards. A photograph of what looks like a homeless woman is blown up to larger than life size and a wooden bust of a man tips forward to knock its head repeatedly on the wall, filling the room with the sound of fruitless efforts or a failure to understand. McGee acknowledges – and experiences intimately – the discomfort of being both a celebrated street artist and canonized figure with gallery representation and work in several public collections. 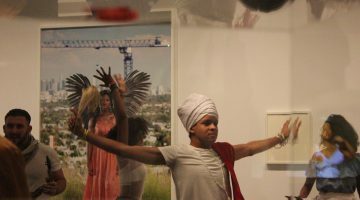 The exhibition runs through September 2. Previous post SFAQ Issue 14 Release Party in Los Angeles, September 7th!